One of my must-haves every time I visit Hong Kong is the wonton noodle soup or 港式雲吞麵, you can find wonton stands everywhere and a bowl can be as cheap as 30 HKD (about 3 USD) with 7 juicy & tender shrimp wonton, chewy egg noodles and flavorful, warm seafood broth. A dish like this is perfect for dinner on a cold winter night, or if you prefer, a hearty breakfast in the morning. For this recipe, you can “mass produce” the wontons and keep them in your freezer, they’ll last about 3 months. Although this recipe doesn’t include the recipes for the noodle and soup, you can basically use any noodle-soup combination you want. Purée half (225g) of the shrimp using a food processor, you can mince the shrimp with a knife too, but it’s just too much work. Cut the rest of the shrimp into 3 equal pieces. Thoroughly the puréed shrimp, cut shrimp chunks and minced pork together, add the egg, bonito flakes, cooking rice wine/Japanese mirin, soy sauce, starch, chopped chives, salt, and ground pepper. Stop stirring when the mixture turns into a pink, consistent, smooth paste. Place about a teaspoon of the paste in the center of the wrapper, wet the edge and fold it diagonally. Then wet the 2 tips and press them together, repeat until you used up all the wrappers or fillings. Bring a pot of water to a boil, then carefully drop the wontons in the boiling water. 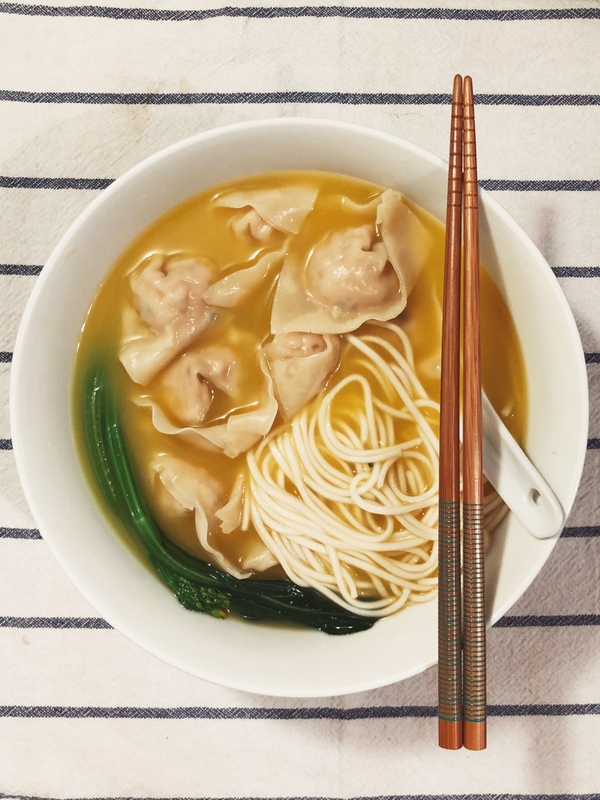 The uncooked wonton would sink to the bottom of the pot, and a good indication of the wontons are cooked is when they flow to the top of the water (the same rule apply for both fresh & frozen wonton). Serve the wontons with some blanched greens, noodle, and soup. Enjoy!